Through his never-ending sense of wonder and curiosity, my colleague Jon Ericson recently posted some findings on his exploration into the possibility of ...hastily written... questions essentially becoming an (inevitable or not) self-fulfilling prophecy. discourages anonymous users from asking a question. This, as we confirm it more and more, is relatively easy to fix. While comments are treated differently than standard posts when it comes to their expected life span, the tone and civility of comments should be no different than what we expect in regular posts. You don't often see condescension like did you even Google it? as an answer, at least not one that stays around very long. Why would we tolerate that in a comment? The appearance of our community created by subtle put-down comments such as "that's such a silly approach" is as incorrect as it is unfair to the countless people that go way out of their way every day to show others how far the limits of patience can really be tested. The first thing we should do is actually the first thing we shouldn't do, which is we shouldn't make even more people feel bad about a bunch of comments that we're pretty sure nobody intended to be toxic. This isn't a blame game, unless someone has a history of coming a bit unhinged, but we already deal with that as an exception. Don't feel bad about not being a saint; being okay with not being perfect means being okay with stuff you didn't think enough about prior to typing vanishing on occasion. It happens. Avoid subtle put-downs and rhetorical statements like "Did you even try Googling?" or "Are you too lazy to run it and see?" Avoid accidental misinterpretation of your comment by being deliberately explicit about your intent. For instance, if the question is about 'foomatic': "I'm not asking rhetorically; I really want to help you with this, I just want to be sure you also searched for 'foomatic'" is a lot better than "Did you even search? what for?" ... we'd be in a much better place. As we work to make our be nice policy into a more codified and formal code of conduct, we're being much more deliberate about what kind of language isn't acceptable, but we don't need to wait for that document to be done in order to curb this problem by just not adding to it, and cleaning it up as we see it. We know we have more work to do with question quality, and we're doing it, but this is important, too. We pretty much already have this policy, we're just calling on everyone to enforce it more consistently, and treat the language used in comments with the same scrutiny that we apply to posts. It's something we can do, now, to make folks less apprehensive about jumping in. Questions? Thoughts? Have at it. If you don't have time to say something politely, just leave it for someone who does. have become jaded and tired of seeing too many poor questions, and no longer have the patience to be nice about it. It's easy to think that 3) is the problem here, but in fact 3) is as understandable as 1). Especially on a big site like SO, there are going to be a lot of low-quality questions, and highly active users are going to get fed up after seeing too many of them. 3) is a natural reaction. The real problem is actually 2). There's almost never anything so outstandingly perceptive about your feedback that someone else couldn't also notice the same thing. And that someone else might be able to say it more politely. If you feel pissed off when you're composing that comment, it might be better not to post it at all. Leave it for the next person, perhaps someone who hasn't just seen fifty other poorly researched questions, someone who has more patience left in them. 1 Not you, Tim Post. You, the generic user reading this. My one word of caution with this is that we have a (significant?) number of users here for whom English is not a first language, or a second, or even any (anecdotally, I have seen a number of questions asked in Google English). Hast du Google benutzt? Nach was hast du gesucht? Have you used Google? What did you search for? Did you even search? What for? Further, our users from non-European countries such as India and China may have entirely different standards for what politeness entails; to them, what may seem a perfectly reasonable comment may seem highly snarkastic to us, simply because of a lingual and cultural barrier. I don't pretend to be a scholar in international sociology, but I guess my take-home message is that structured politeness is often difficult (not impossible) for English as a Second/Third/Fourth Language speakers, both due to vocabulary challenges and cultural differences, so please keep that in mind when moderating comments. Critical comments on answers are more important than critical comments on questions because they (generally) contain technical corrections to the material in the answer. Your proposal here encompasses them - you're talking about "comments" generally - yet your post doesn't actually acknowledge that they exist or examine whether the issues around them are the same as those surrounding question comments. My comments generally aren't intended to "help" the person whose post I'm commenting on, but rather future readers. Depending upon how the call to delete comments that are more "condescending" than "attempts to help" gets interpreted by flaggers, I fear that this will be used to justify deleting them. But comments that aren't meant to be temporary, and aren't meant to result in an improvement to a post, have always been a crucial part of our quality control system. We have no other mechanism for pointing out the way in which an answer is fundamentally wrong. There is no way to criticise the technical content of an answer that won't be perceived as rude by a large fraction of the userbase. Write the sort of fluffy, saccharine prose that the April Wensels of the world would like us to write, and half your readers will feel that they are being patronised and treated like fragile children. Instead skip straight to the technical meat of your point, and the other half of the site will feel that you're "unkind" or a "Zuckerbot" or whatever. When dealing with a community that is split into camps with diametrically opposite standards of what polite criticism looks like, it is impossible to be universally perceived as polite except by never criticising anything. But that's the worst possible outcome, because pointing out technical inaccuracies is valuable to future readers and that value is more important than whether the comment is perceived as rude. The staff have failed to articulate or provide examples of what their standard of politeness looks like (as far as I know, we don't yet have the dataset we were promised in https://stackoverflow.blog/2018/06/21/rolling-out-the-welcome-wagon-june-update/ showing what comments were considered "snarky" or "unwelcoming" or how that classification differs between staff members). Also, comment deletion doesn't trigger any kind of notification. What this adds up to is that even if we want to comply simply for the sake of avoiding having our comments deleted, we have no way of knowing what compliance looks like. In any case, making all authors here adhere to standards of politeness that are not their own is in itself unwelcoming and oppressive. The most upset I've ever been by a mod action on Stack Exchange was when a well-meaning mod edited a comment of mine for tone in a way that I felt made it drastically ruder by turning what was previously some (very blunt) technical criticism into what, to my ears, sounded like some kind of unhinged moral condemnation of the answerer for even daring to post. Trying to force your particular standards of politeness on a diverse community with different linguistic norms is a recipe for having this conflict constantly with an even larger fraction of your userbase. Whatever changes in rules we do make to comments moving forward, if they're going to retroactively make a bunch of valuable existing comments illegal then we need a mechanism for preserving the value of those comments - either grandfathering in "unwelcoming" comments before a certain date, or adding in comment deletion notifications so that users can attempt to repost a more "welcoming" version of the same content, or requiring mods to post a more "welcoming" comment with the same technical content before deleting an "unwelcoming" one. Otherwise, we'll set fire to a whole bunch of valuable content. I've contributed far more (precise, technical) criticisms of other users' answers than I've ever contributed answers; those comments are probably, in aggregate, more valuable than my own answers are. Despite assurances I've had to the contrary, I remain afraid that in time they're all going to be nuked, because nobody on the staff has yet seriously addressed the question of how we can radically change our commenting standards and not destroy lots of valuable historical content. The repeated calls, like this question, for users to go forth and purge (vaguely defined) new classes of problematic comments from the site seem likely to achieve precisely the outcome that I'm scared of. I'd rather we just dropped this entire quest to improve comment civility, which I don't expect to achieve anything at all. But if we must do it, can we at least see some acknowledgement from the staff of the probable drawbacks - measured in valuable content destroyed or never created, in users with different standards of politeness driven away, in internal conflict created in the community, and in time and effort and self-doubt expended by commenters trying to comply with nebulous standards that they don't really understand - and even a minimal attempt to approach this problem in a way that mitigates them? Preface: This answer will be written with Stack Overflow-coloured glasses because the comment snark issue is topical there right now. If your house has a sign outside that says "Do not track mud in", because you want to keep it clean so that it's a nice environment for everyone who uses it; and someone walks in tracking mud, and you ask them if they read the sign, and they say "Lol no didn't bother"... are you not going to be in the slightest bit peeved? Are you not, perhaps, going to respond to the rude mud-tracker with a somewhat snarky comment? Assume you did. And assume that after the mud-tracker is long gone, someone who also lives in the house comes up to you and harangues you for being nasty to that poor widdle mud-tracker. Are you, perhaps, not going to be somewhat peeved that your efforts to keep the darn house clean are being punished instead of rewarded? 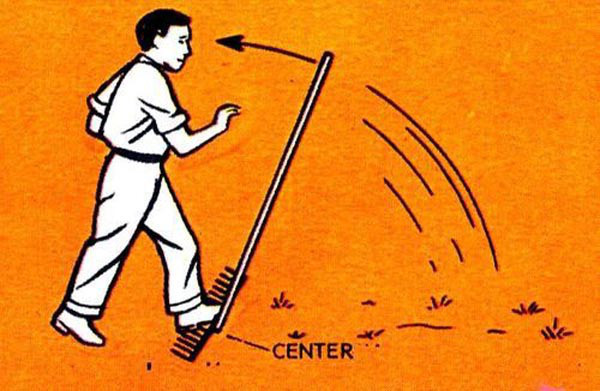 People who post snarky comments on questions are trying to keep the house that is Stack Overflow clean. And they are human: sarcasm is a quintessentially human thing and a quintessentially human response, especially to rudeness. The people who ask bad questions are the ones not Being Nice. Yes, we should all hold ourselves to the highest standards and not respond to them in kind, blah de blah, et cetera, but it's difficult; for some people, really difficult (and that may have nothing to do with how Nice, or not, said people are). And, I would argue, quite unreasonable. Stifling sarcasm because it's Not Nice isn't solving the problem of bad questions, it's just shifting the blame of bad questions onto people who actually care about deterring some of the bad questions. If you want a website filled with perfectly polite and completely civil robots, by all means, go ahead. But if you want human beings to participate in your site, you have to accept some sarcasm here and there. Addendum: This does not, in any way shape or form, mean I support trolls who exist to harass hapless new users. If you behave badly for the purpose of causing disruption and torment, you should get the chop; if, after a long and bad day at work, you lose your cool and direct a snide remark at a user who posts a "gimme teh codez" question... are you really a terrible human being? Or, just human? We know from talking to people who don't contribute that one reason is because they see discouraging comments on the site. Perchance, is this "we know" in the same vein as Jay Hanlon's infamous "Too many people experience Stack Overflow as a hostile or elitist place"? I.e., completely unsupported by any sort of empirical data? This holds for the mods too; fear not, the community is eager to hold mods to an even higher standard than the average user, and mods intervene in each others' content when needed. And this helped a lot. Community members now clamp down on incivility in chat, flag comments that aren't just outright insulting but are passive-aggressive incitement, and similar. We haven't had anything like the main and meta flame wars that used to simmer and flare up because people have found out they can't just keep being "mildly offensive" all the time without consequence. Makes it a nice and professional place. Who decides if it's "mildly offensive?" Just like everything else, the community and the mods, working together using flags, chat, meta, etc. It is true, doing this drives some users away - some who are chronic problem users, and some who just don’t agree with the SE philosophy on comments etc. However, as our site continues to grow strongly, it seems to us that it is then made more welcoming to those who do want polite Q&A. There’s always Reddit and dozens of other sites for those why want to say whatever they want whenever they want; there’s obviously benefits and drawbacks to the SE approach and it’s not for everyone. But in our case, the community prefers it (see also: What to do about comment misuse?). And when people dissent or want to change how it works, they can take it to meta, and if the community agrees or demurs it’s fine - but when they then want to cause trouble across main and meta with continual passive aggressive commenting because they didn’t get their way, we action on that. No new user finds people arguing on their question welcoming. Some folks find any moderation “Not Nice,” but that’s a philosophical difference that I don’t think is supportable within the overall SE philosophy and goals. I believe this approach can scale; as people learn the rules and become more civil the need for actual enforcement has reduced on our stack - the one thing that is an issue is the lack of SE support for comment deletion by anyone other than mods. Our community does a good job of flagging, closing, editing, and so on in general. Some kind of flag/review queue/downvote/whatever mechanic for removing comments would make this perfectly scalable. Apparently multiple flags will now delete a comment (not 100% clear on the exact functionality), which is helping, but as we're a smaller stack multiple flags on the exact same comment is a high bar (I wonder how much it's happening, actually, I am not sure how to tell). One of our biggest mod jobs is comment removal at the moment, as others can only flag. But that's something SE can help us with functionality-wise if they're serious about this approach. There seems to be a lot of discussion about how RPG.SE is tough on comments in general, which is true - but not super relevant to the question at hand. Should we let comments be "Not Nice"? Obviously, no, we should not. If your site wants to allow answers in comments or discussion in comments or whatever that's a separate topic. But can we really justify saying any part of the places people communicate here on SE shouldn't be nice? I am borrowing two ideas from @Erik von Asmuth and @Troyen in their comments under the question: if the problem identified by Jon Ericson is one of perception and impressions left on casual and new users, then SE can change the optics of the comments under questions and / or answers. Erik suggests that the question is an XY problem, and Troyen points in the same direction. I think they have a point. A possible solution to the optics problem is to by default hide comments. The user won't see them until you click on "comments" or some such text as we do with links. It might be simpler to unmask comments by default when one logs in. Whether one has to be logged in to open comments under this idea, unless it is the persons question, is a usability question that probably needs to be sorted out if this gets as far as a feature request. If one is moved to comment, one more click or keystroke is not too much to ask, so please don't object on the grounds that it's too much effort to click one more time. I also suggest that anyone who asks a question or writes an answer by default sees or views the comment/suggestion. While this answer may be pointing toward two features to consider, not one, it may not be. I consider how to get a question asked, so that may already be folded into basic functions and not need further work. What problem does this proposal solve? It addresses the perception problem cited by Jon by doing what SE says is does as it presents it's questions and answers to those who visit the site: optimize for pearls not sand. I have been told time and again, as have others, that the Questions and to a far greater extent Answers are what matter in the long run; comments are ephemeral. From a visual presentation sense, hiding comments removes the disconnect between what is shown on the tour page next to the following declaration, and the reality as shown on many SE sites. Chit-chat is all over the place, in comments, on multiple SEs. I notice this clutter particularly on Workplace, SSF, History, and Aviation when I participate on those SEs, but I have seen it on others that I'll not name as I am rarely visit them. The comments are available if one chooses to actively get involved in a given question or an answer. For example, if SteveTheStacker is a C-Sharp expert, he may want to engage on a C-Sharp question, and be likely to dig into comments as part of the process of offering an answer, or posting a comment to a question or an answer. What are a few drawbacks? This won't address any optics problems perceived by regular users, as they'll be able to see comments as usual. This is probably not a problem that optics can fix anyway, for the regular user, which this meta question points to in various ways. It requires time and dev effort which is a finite resource. Perhaps this isn't that big of a drawback. This answer points toward a feature request; if Jon and the corporate leadership think that what he has described is a problem that needs solving, then applying resources to solve it, at least the perception piece, is within their power and perhaps furthers overall SE/SO objectives that drive traffic to the SE sites. A final drawback: a casual user would not see a comment that warns anyone reading "that's wrong, you forgot about (X) or (Y)" as well as a comment like "this is a highly up-voted answer that is wrong because of (Z)" ... while the latter is a rarity, I've seen a few examples. This drawback can be mitigated by hiding comments on questions, but not hiding them on answers. Thanks to @Wildcard for the comments and points on that. There is already a Be Nice rule that either is or isn't followed by the SE faithful. If that rule isn't enough to prevent snark and rude comments, how will yet another rule do so? People, or some people, already aren't following a site policy if Be Nice isn't happening. Fixing the optics doesn't require that really hard thing of convincing people to change their behavior. What it does do is clean up the visual presentation of the Q's and A's to the casual user. Result? Less noise, more signal for the casual user looking for questions and answers about (fill in the topic here). As I am fairly new to SE, I may simply not know that 'We've done that before, Korvin, and here's why it didn't work.' If using a default to hide comments has been tried and has been bad for some reason, it may still be a worthy idea that needs a slightly different implementation. Addendum: I see that Tim responded to my comment under the question. And yes, we've tried various strategies of hiding comments, toggling what's hidden and expanded and stuff and .. unfortunately .. the kind of stuff that causes the most problems is far too often up-voted. I did address in the answer that I didn't see this dealing with frequent users, who are not the class of users for whom this is Jon's concern. Yeah, I can see that as a piece of this problem that masking can't address, but that's an 'in-house' bit rather than 'casual user' bit. So, maybe try it differently, or maybe not. I am glad to find out that something like this has been tried before, so no feature request for now. Thank you, @TimPost, for the feedback on that in comments. Aren't you afraid that this policy will encourage the Don't comment, downvote! behaviour, which will be just as intimidating for newcomers as unwelcoming comments are? Commenting on a bad post already exposes the commenter to a possible follow-up discussion that most would prefer not to have. Now the commenter will have to find a polite way of telling the OP that their post is bad, or simply downvote and move on. As a newcomer, would you rather get an anonymous downvote, or a comment saying "Why don't you run it and see" or "Why are you using Tool X when you could use Tool Y instead"? You don't often see condescension like did you even Google it? as an answer, at least not one that stays around very long. The reason posts may have such quality standards is precisely because there are people policing them with great vigor. Do you plan on doing the same with comments? This takes resources, maybe better spent elsewhere. How do you tell users they're commenting wrong? Avoid accidental misinterpretation of your comment by being deliberately explicit about your intent. For instance: "I'm not asking rhetorically; I really want to help you with this, I just want to be sure you also searched for 'foomatic'" is a lot better than "Did you even search? what for?" People won't understand they're commenting wrong unless there is feedback. How would you send the feedback? Comments are second class, and for good reason: they're not the point, the Q&A are. Everything has a cost, I don't see how comments can be held to the same standards as the Q&A without sacrificing the quality of the Q&A. I want to lay out my perspective here because it seems to be quite different then what this post is implicating for new users. I'm not a particularly new user anymore, but I used to be just 2 years ago. Back then I made a lot of blunders in my early SE life, and I got called out for it, I found that unusually refreshing and respectful of my time and efforts. Useless answer, essentially translates to "It doesn't work because your code is wrong, once the code is correct it should work"
Now that'd be quite "un-nice" under the new policy, would it not? But it was the most helpful comment I'd actually gotten at that time, my 2 previous answers just went ignored without any votes (up or down) or any comments. That was discouraging. I was elated to have someone take the time and evaluate my answer, and even though their comment was somewhat lacking in proper tone, but it was valueable in shaping my understanding of what kind of answers would fly on stack overflow. In the following weeks and months I got many comments that were sometimes rude, sometimes snarky, sometimes demeaning of my abilities as a programmer, yes. But they were above all topical. They helped me learn and correct my shortcomings. I would hate to see comments like these deleted before I could read them, or even worse, never posted. Not because I'm a glutton for getting insulted, no, because I found the guidance and actionable criticism presented in them to be easily the most valueable part of my early SO experience. It would be much more productive to try and address the real issue. The entitlement attitude that an apparent majority of new users seem to have now and how they crap on anyone that tries to help them succeed on the site, no matter how neutral or even polite the comment is. They need to be reminded at every opportunity that are receiving a free service/help and to be polite and appreciative of those trying to help, no matter how the help is worded. It is extremely obvious that those looking at ads are valued much more than those generating the content that the ads are placed in. The powers that be need to be reminded that without the content from the contributors in the first place there would be no reason for anyone to visit the site to see the ads. Unfortunately the entitlement attitude is what the official StackOverflow blog re-enforces with recent blog posts by people in a apparent position of authority providing plenty of confirmation bias to those looking to be offended in the first place. If we're going to delete "not 100% welcoming" a little bit too snarky or however else offensive comments which despite being not ideal contain useful information, I want to be able to see those deleted comments to access that useful information. Maybe as a reputation threshold privilege. And hide the potser's username to save face. Because I'm already suspicious and don't trust what some overly eager moderators or users might consider "too unwelcoming" and sacrifice potential answers or good leads for being 100% nice and welcoming all the time. I could not agree more with this take on holding language in comments. I had created my Stackoverflow profile a long time back, but one of the main reasons I refrained all these years from posting my own question or attempting to answer one is because of fear of being called out stupid! encourages the OP to ask again and discourages anonymous users from asking a question. I accepted the comment and made the edits leading to an upvote and an enormous amount of encouragement. That helped a lot given the fact that I was questioning if it was even worth trying (Stack platforms can be brutal). If I am allowed I would like to offer my newbie perspective to this and add one thing to the list. Taking reputation of OP into consideration while offering comment. "Did you even try Googling?" or "Are you too lazy to run it and see?" Taking a glance at OP's reputation might suppress that temptation and you could phrase it a little more nicely. People's threshold for calling out bad comments would decrease. The post author and the comment author would be able to see that the comment isn't universally approved. People would be more careful about the content of their comments. It would be easier to find comments that truly need deleting. 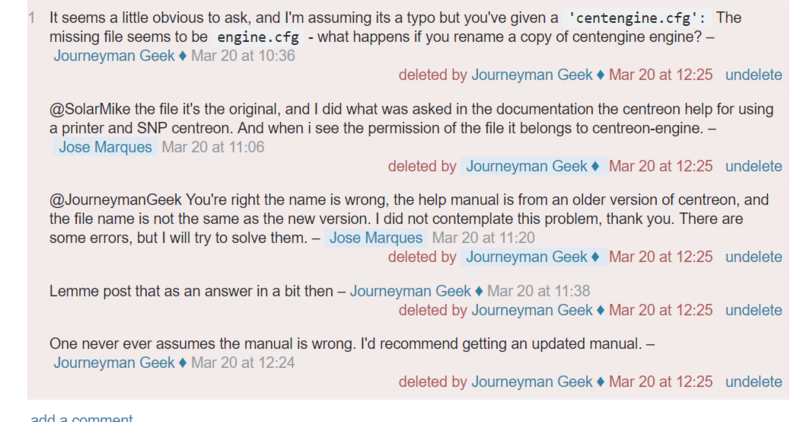 Without quality standards effectively enforced, Stack Exchange is just a forum. Disciplining quality maintainers without any commensurate effort to address the problem is a choice to have lower standards. (The wizard is a nice thought but not going to help with this.) I don't like that choice, but it's consistent with the recent direction, and the community that remains here in 2018 is accepting of that. It's a pretty good forum. And a polite forum is better than a rude forum. But the old claim that it's something different and special is no longer plausible. So I guess I approve, now that we've given up the dream. I think the big difference between comments and posts is how people approach them, and that's why the expectations have seemed different. Answers, for as long as SE has existed, have had a clear, enforced purpose. If you post an answer that doesn't attempt to provide a solution, you can expect to be told—loudly—that you're doing it wrong, and pointed in the correct direction. There's even enthusiasm from a lot of users in making sure that our answers section stays clean, and free of non-answers—even newer users understand that jokes, questions and chit-chat aren't welcome in answers. Some people dedicate a lot of time to reviewing posts and flagging posts that don't fit the clear definition. But comments are different. While we do have a clear definition of what they're designed for, there isn't the same amount of pushback when you start posting other things. As Journeyman Geek points out, most snark and condescension doesn't count as requesting clarification, and isn't within the clear purpose of comments. I don't sense the same amount of interest, however, in enforcing that. If you do get it wrong, you might not even know. You don't get any notifications or pushback from others or the system; your comment is just... gone. Comments tend to have the appearance of being "anything that isn't an answer" rather than "requests for clarification". The system just presents you with an empty box when you post a comment, and the expectations aren't as clear. If we want to hold comments to the same standards as posts, we need to make the expectations clearer. Let's make sure that the purpose of comments is made clearer, and I think that it'll be harder to legitimately post snark. If we can make changes to the system to make comments less "free-form text box" and emphasise that comments have a very limited purpose in the system, we can do a lot to reduce snark. Essentially, this is your "Refrain from commenting" approached from the other angle—what if we redesign the system to discourage inappropriate commenting? I definitely think the 'request clarification' link is a promising idea, but I wonder if we can do more. Even that didn't have a huge effect on reducing comment flags. Maybe we need to do more to let people know they're going wrong before the problem is too serious to fix easily. Something similar has come up before and there are a few things worth remembering. There's a similar question on requesting a style guide to avoid condescension.... Here's the joke. I had a dissenting opinion on where the line would be. The author found me condescending, as did another user. I found the author condescending too. We might... all be right. It's just a very hard thing to judge. The lines are hard to draw, and some that can be apparently condescending can end up being useful. It's possible we're all well-meaning folks, or all terrible, or somewhere in-between. It's a bit of a fuzzy issue deciding whether something like this crosses the line or not. This can potentially be a problem. Kinda ironically, sometimes the obviously simple solution, the one that seems almost too simple is correct, cause we're sometimes a bit reality blind. Frustratingly, these are the hardest. Did you try googling is inappropriate, sure, but I've had situations where I had to, very carefully, ask a condescending sounding clarification and ended up solving the problem. Case in point.. I think though, you guys already have a solution that works well - that ... we shouldn't have comments at all. We need clarifications. In a sense, we've always done comments wrong. That people even use comments as chat, or a way to do anything other than ask about ways to make a post better, kind of goes against the low noise ethos of SE. We've all done it wrong, sure, but this approach is probably a lot clearer than and easier to get for most. I think a good rule of thumb really is "Does this directly help clarify a question or answer?" - and bring the focus back to the signal, rather than "is this nice"
"Did you try googling it" or "did you read the manual?" is noise. "There seems to be an error there - did you try changing this" is signal. "This is in the manual, page 25" ... can be a useful comment, but really should be an answer. So, we don't want "not nice comments", both cause they're not nice, and cause they're noise. Now, I understand, and appreciate the intent of trying to tell folks to be nice in comments. On the other hand, I think keeping an eye on what we need to do - kind of works better. I think the issue is that we tend to think of comments as second-class, but the page layout privileges question-comments ahead of answers. As it stands currently, the 'most-important' (usually upvoted) comments are shown directly under the question, while the answers are formatted well below the comments. For many users, this means that comments fall 'above-the-break', with no need to scroll to read them. Meanwhile, our main content, the answers are formatted below the comments! Even our best-voted answers can end up below-the-break, requiring scrolling to see for many users. Secondarily, at least on SO, I see a lot of partial solutions and problem solving in the question comments. This makes the casual, anonymous user find what they're looking for in the comments. They never have a reason to even look for the answer section. Potentially controversial opinion - but while I'm all for encouraging nicer and friendlier comments, I'm not really sure what this post achieves. It's basically a fair few paragraphs that just say "everyone be nice in comments too! ", which, as said above, is a policy that's in place already. It feels very much like we're trying to pat ourselves on the back here for noticing that comments can be offensive as well as answers, without really doing anything else about it. Such an active system doesn't have to be of the "ban" type of course - it could disable comments entirely on questions that start to receive a negative score and push people into a chat room instead where they can try to engage with the poster in a better way. I'm not saying either of the above are necessarily things that should be put in place as described, but surely there's more effective things that can be done here. Otherwise, the best case outcome I can see is we get a small army of people being a bit nicer for a while in comments, everyone pats themselves on the back and says "look, we did something about the be nice thing", and then within a few months everyone forgets about it again, and bingo - we're back to square one. For many questions from new users, the initial question needs a bit of work to turn it from un-answerable into fairly good. That work can currently only be done through comments or close votes. For me, I'm always having to search to find the friendly language with the right help centre links for these clarification requests. Sometimes I'm in a hurry and just tap in something short instead of all that work, and quite possibly those come across less welcoming. What would make my life easier, and hopefully the site more welcoming, is more "canned queries" for common question clarifications. These should have friendly language in, and useful relevant links, and will need to vary by site. They may also mean we need to vote to close less at the start, which also isn't welcoming. To help make things look friendlier (since comments show up obviously to browse-by users), they could easily be hidden from non logged in users. That way, other people trying to help can see the clarification has been asked, to avoid piling in, the question user can get a more welcoming and also more useful request for the clarification, and we'll find it quicker to help so we'll help more! You seem to be using a really old version of the library, are you constrained to stick with that old one (complete with known bugs), or can you try upgrading? Don't we have a be nice policy that is site wide and for all? It's not just be nice when answering, or commenting on a question/answer. Or while in chat. The issue is IMO enforcement of the policy in general. We have flagging, and that helps, but the ultimate enforcers -- the moderators, need to set the standard. Power users on a particular stack can help with this too. My experience here thus far is if you have a lot of rep (that number varies site to site), the be nice policy is more pliable for you. Equal enforcement of the be nice policy is what is needed here. If a message doesn't serve its purpose should be flagged and eliminated. If there is "a negative comment on a bad question", I assure you that the "bad question" was deleted before it can be seen. To test for that, ask people where they have seen a "negative comment" not directed to themselves, on a question they do have. You would again reduce yourself to anecdotal evidence. Negative comments on bad questions simply doesn't effect potential askers because they were seen on the site, but because the askers, understandably upset, decided to give more visibility to it by referencing it whenever they consider it relevant. But that problem is beyond the main point. Lets talk about solutions. If the problem is that people leave comments on questions, how about if we don't call them comments anymore? Robert was mulling with the idea of changing the UI name for the comments. Maybe that's a solution for the comments on questions, no? Granted, is a cannon to kill a mosquito, but some mosquitoes can't be killed even if you use one. Other solution would be to prevent bad questions all together. Following the premise of Jon, maybe the algorithm should err more on false positives and be more stringent on what it considers a no "bad question", that would works towards preventing folks of understandably frustrated, lashing out against a poor question. Another solution is maybe we don't actually are negative when we offer feedback... maybe we actually are offering positive feedback that's just shown negatively because that's what we interpret. Remember, sarcasm doesn't work well with written communication, it isn't a stretch to say the same about feedback. How about if you get random comments from a site, manually tweaking them making them more or less negative, and show them all to some guinea pigs and ask them how they see that feedback and how they would have offered the same feedback if it was them. That would at least set the goal towards what actually can be achieved. Remember, war on concepts aren't winnable, because concepts are too abstract to be actually conquered. This is a small suggestion for a larger issue, and not meant to be an exhaustive analysis or solution. I like the analysis here, and it makes sense to me. And, I agree with the objective of encouraging users (including new users) to contribute to the site, versus disappear in response to perceived hostility. As a contributor to the site (mainly SO, and a couple others), I often empathize with the snarky comments in response to bad questions. I have no doubt that I've been guilty of posting snarky comments myself. Another thing I've been guilty of (not recently, but definitely not never) is up-voting snarky comments. In the moment, these actions can feel rewarding. In retrospect, when the frustration has faded a bit, it feels less good to have made such comments, and to have validated others who have done so. This is a minor (very minor!) contributor to the landscape of the current issue: comments can gather up-votes (ie internet points) and these can lead to badges (more internet points). And, in my experience over the past years (feels like a decade, but not yet...), snarky comments often gather such internet points. When I read the post analyzing this issue, I realized that it can feel like the site is (unintentionally) rewarding the behavior we hope to discourage. Don't get me wrong, constructive comments are very helpful and ought to be encouraged - I always read the comment thread as if it is part of the question and/or answer, it is very valuable, and the up-voted comments are a great way to draw my attention to the best places first. So, I'm definitely not advocating for getting rid of voting on comments. But, it feels like a mechanism to discourage up-voting on snark would be useful. Proposal: Penalize up-votes on comments which are eventually deleted as rude or snarky. I don't pretend to have a perfect mechanism in mind, but I think it could help. To casual visitors, question comments are more visible than answers. We know from talking to people who don't contribute that one reason is because they see discouraging comments on the site. Let comments expire & auto-delete them after a set amount of time (days, not months). Auto-deleting comments would then affect mostly the social interactions that aren't directly relevant for the post's content. Of course, while this would help get rid of snarky, discouraging comments quickly, it would also mean that you no longer get the positive, funny, engaging comments that you see all across SO. It would all be about the posts. I realise this might be perceived as a rather drastic change, and I'm sure I'm missing some important considerations, but I wanted to throw the idea out there. I can't agree with the dissenting voices here hard enough or fast enough. There is no measuring stick by which everyone can agree "this was not rude." Every time. "This is what my thoughts were at the time..." "This is what I thought I heard you say..." "Because of X my brain jumped to Y..."
I never even get to finish my sentence before I get jumped on for being an a$$hole or an idiot. "HOW could you POSSIBLY think that was true?" "But I didn't say that." "Why would you even think that?" Every time I've ever seen anyone else try and explain their thought process, they get jumped on before finishing their sentence for the same reasons. Apparently I am a utter jerk whose sole purpose is to make your life a living hell and insult you. If you think so, just report me, because odds are I was only trying to help. If you accuse me of being a jerk, I'm just going to report you instead. I have received dozens of private messages from people who read that and went "I get it!" because my post had been nothing more than Use X() or a link to documentation or similar and figured out that I wasn't being a jerk! I was just communicating everything they needed in a small package. But no, most of the time I post the bare minimum of what's needed to convey the information I'm trying to get across. It's what we ask of people in their questions, no "hi" no "thanks" no complete projects, just the bare minimum to explain the problem and the shortest code necessary to reproduce the issue. Why should comments be any different? And besides, including that flowery language is just going to upset another group of people for being too patronizing. I've seen it happen, both online and in meat space. No matter the context. If you're volunteering information they did not ask for, they don't want it. And if they did, it's still your fault because now you're "getting defensive." As soon as they've got it in their heads that you're being rude or disrespectful, you can't change their minds. You've already lost. And because of that, Stack Overflow cannot get those potential users back. They already think we're jerks, no amount of flowery language and aggressive moderation of perceived harm will change that. They'll just point at the moderators as having "rudely deleted their [comment, post, question]" instead, or find some other imaginary slight against them "because they're new." Bring on the down votes, retaliatory "you're wrong" comments, and the like. All it does is show how right I really am: you don't want to hear the truth about your own psychology and just how predictable you are. And no, I'm not trying to be a troll, all I'm doing is pointing out is a pattern. You'll start to recognize it in every argument you ever try and peacefully resolve and only to make worse soon enough. Yes, even this very statement will attract those same remarks for the same reason. Remember, I am a complete and utter jerk whose sole purpose is to make your life miserable. From what I read and see, the main course of action that will satisfy most users seems to be simply hiding more and more comments as the question ages. If there's many comments, we already use this system: Only those with enough upvotes will be shown, and all other be hidden. By expanding this to all cases as opposed to when there's too many comments, the visibility of "unuseful" comments is drastically dropped, and the perception problem mostly solved. The only case where this approach fails is when a snarky comment actually gets upvotes (which is, for no-effort-questions, mostly the case). This however is an expression of character of our community (or rather a part of it), as those upvoting users probably see a no-effort-question just as offensive as other the snarky comment. However, even in this case, I see no reason to take any action: A snarky comment is also an indicator of what went wrong, and gives a person to ask for how one could improve his question (which is again not the case if the question is closed). Even for new visitors, a no-effort-question should still be obviously a no-effort-question. People who actually want to post no-effort-questions (sadly) won't be scared away by that, and the bulk of the probable future community members will see the point of the comment. Thank you for this post! Making StackExchange more approachable for new users and tolerable for long-time users is a great initiative. However, I think that the suggestions for behavioral changes could be improved. Skip to the bottom for a TL;DR. Many of the answers have the biggest problem with these items on the list, and for good reason! Sarcasm is a powerful tool! Used effectively, it provokes thought in the listener/reader; used carelessly, it can simply becomes a pointless slight. To add to this, when I was a new user I liked it a lot more when people gave snarky criticism on my content then when nobody bothered to react or respond at all. 1) No. What should I Google? 2) Yes. What should I Google? Anyone who asks this question is not being helpful. They know both outcomes before they ask, which wastes the time of the asker and any future readers of the question. Please don't do this! I would prefer comments be concise and to the point. I'm searching for an answer, not reading a novel! Unless extra text will help the original author or a future reader, please do not be verbose or comment at all! As was said above, some of the most upvoted comments are the jabs, sarcasm, and rude comments. In this way, the community has spoken! A lot of people (myself included) love the humor these can generate. Putting a smile on my face is valuable. While reminders to be friendly are always good, I often fail to notice if my tone is bad when I'm tired or frumpy. Unintentionally bad tone happens. A pattern of repeatedly rude and unhelpful behavior is something for the mods to sort out. Why not simply get rid of the "comments" all together? As some meta and blog posts show, SE never wanted them anyways... and they still seem to be problematic today. Comments introduce noise. Too often they are used for extended discussion (with a tendency to go off-topic) which is what chatrooms are for. Comments are abused to provide answers — which tend to end with a "thanks, got it" comment and an abandoned Q without a real answer. While the main SE message at several metas, in the help centers, and in the blog is that comments should be considered to be temporary, they practically are not temporary — which opens the gates for 1 to 3 above being permanent issues. Assuming we're still targeting this to be a Q&A site and not want to slowly let this mutate towards an average forum site, I'ld like to propose to drop comments and replace it with a section called "clarifications" (or something like that) which is initially hidden behind a link (click to view and use). Do not handle that new section as the current comments thing, but rather as "clarifications to be incorporated into the question/answer to make it better and more clear" section. Think along the lines of edit suggestions, but with the ability to communicate with the OP if this or that is what OP means, or if OP can clarify something specific which then gets edited into the Q or A. Do not allow anything besides such clarifications. Simple, easy, done. You can even adapt SE gamification by "rewarding" good clarifications when they get edited into the Q or A, while "disrewarding" noise, answers-posted-as-comments, etc. so that users are discouraged from abusing clarifications for anything else besides constructive clarifications. As far as I understand, that was why SE one day decided to enable comments: to clarify. But as it frequently shows by causing various problems (including "be nice" issues), a comment section is the wrong tool for clarifications. From my point of view, it's about time for SE to stop using a "comment" hammer (and all the problems that come with it) , where we actually only need a specialized "clarification" screwdriver. In the end, I guess what I'm proposing is to drop the comments and simultaneously expand the "edit suggestions" functionality with a "clarification request" section. Doing so would provide a better tool to enhance the quality of Q&As, while — at the same time — keeping any related noise (may it be good, bad, or even off-topic) away from public view. Careful... Better define scope a little more. The language standard in posts refers to more than just negativity and obscenity. We also disallow "Thanks" and similar 'fluff' in posts. I can't be the only one who thinks that, for a non-trivial percent of questioners, moderator action being taken based on a flagged comment where they thought they were just being polite, would be off-putting, at least. I believe that a part of being nice is sometimes allowing others to be nice to me, in the way they are comfortable. Are you suggesting that we flag comments that don't abide by the 'no fluff' standard of posts? I don't think you are. But, the title, at least, makes this point ambiguous, and the remaining question text does not yet explicitly address this. In order to make this answer 'votable' by meta standards, I will tack on at the end my opinion that I think that social niceties add to, and not subtract from, the be nice policy's aims, they increase the sense of satisfaction the answers receive, and they positively impact the perception the anonymous users will have of the site. Therefore, I do not believe they should be disallowed or flagged. I agree with this in principle, but feel that it will be problematic to enforce and potentially create a burden for mods. I hate dealing with comment flags. I find them the most time consuming to handle. Simple outdated flag? Still have to read everything to make sure it is OK to remove. Offensive flag? Have to read everything because other comments that may address it. Delete a comment in the middle of a thread? The comments may not make sense anymore. Nuke all the comments or move to chat? May need to edit in some first. Why is SE giving so much attention to the “be nice”-policy?